Thank you for joining me as we count down to the next MFT release. We are four days away from the big day! All the new Stamps, Die-namics, and Stencils will be available on Tuesday, September 1 at 10:00pm EST. Be sure to check out the MFT Blog to see all the new items being revealed today. Don't forget to leave a comment on the MFT Blog countdown posts, YOU could win one of the five $75.00 gift vouchers. I have a fun card to share with you today. 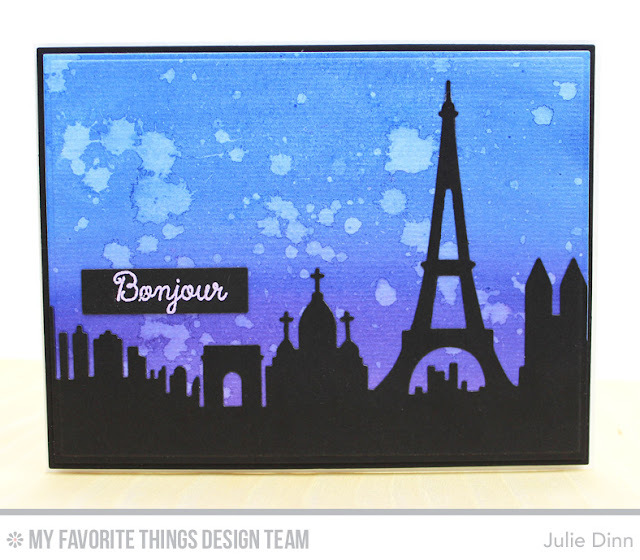 It features the new Paris Skyline Die-namics. This is such a fun die to work with! I started out by creating the background using a couple of colors of Peerless Watercolors. I spritzed the card stock with some water to create the night sky. Once the card stock was dry, I die-cut a piece of Black Licorice card stock with the Paris Skyline Die-namics and adhered the skyline to the watercolor paper. The sentiment is from the Mon Chéri stamp set, it was stamped on a small piece of Black Licorice card stock that was die-cut with the new Label Tape Die-namics. Julie I love the colours you used in your background. I really love the look with the black skyline. A gorgeous looking card! You rocked the background GF! Another reason why I love (MFT) Paris!